It's funny how stereotypes can be so completely different from reality. When one hears the term "Yacht Club", many people picture a snobby Thurston Howell III sitting in a big leather chair sipping 100 year old brandy in front of a roaring fireplace. 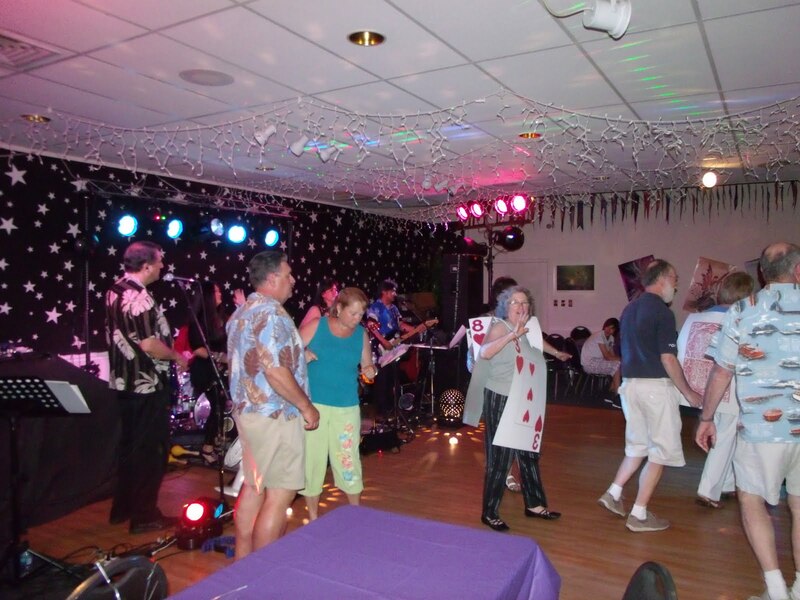 Well, the only thing roaring at the Maryland Yacht Club opening weekend dance were the people as they let loose with a party that was still rocking at 1:00 in the monring when we had to call things quits. Let's face it, these folks know how to PARTY... whether to Dion & The Belmonts or the Black Eyed Peas. It didn't matter whether they were 18 or 80, the dance floor was rocking all night long. Long after the princesses had retired for the night the adults kept the party going to the wee hours, and as the requests poured in the setlist pretty much got tossed aside. A request from the folks on "D" Dock, who attended as a group costumed as the cast of Alice in Wonderland, including the Mad Hatter, a cute little rabbit, and a life size deck of cards, asked if we could fake our way through Kenny Rogers' "The Gambler". (Get it...cards? Gambling? Poker?) A quick trip to the internet to download the lyrics and we were in business...faking our way though it like we had been playing it for years. It's stuff like this that makes performing so much FUN!! !